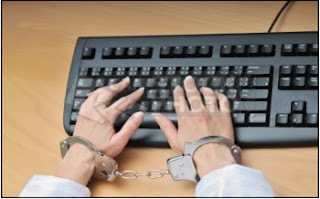 In most of the institutions and companies due to security risk many restrictions are being imposed on network like blocked ports etc.There are many ports that are blocked for outbound connection and few ports for http connection are opened so that people working over there can access there email etc.As the http port outbound is opened so it can be used for http tunnel to access restricted applications like IM etc.In this post we will see how we can do that. It is a technique in which the communications that are restricted in the network are bundled within the http protocol and allowed to communicate.The user uses a httptunnel software with client-server but to use it with administrative privileges. 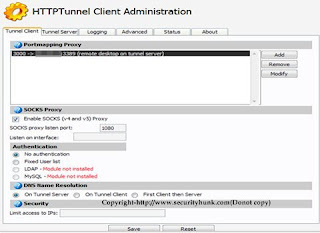 The user need a http_Tunnel-client and a server other than the original client-server.What happens that when the original_client decides to connect to a desire server then it sends its request through the httptunnel_client to the httptunnel_server then to the original_server as shown in the figure below. Actually the restrcited application that is the client(in the figure) sends a request other than http through the httptunnel_client bundle inside the http request.Then the httptunnel_server receives its unwrap,decrypt,uncompress it and forward it to the original server in the same way the data is transferred.The main concept over here is that there is middle (client-server) other than the orginal client-server. 2.Helpful in accessing restrcited pages and sites. 3.May be helpful in bypassing firewall restriction but not in an extensive manner. Lets see how we can use http tunneling. 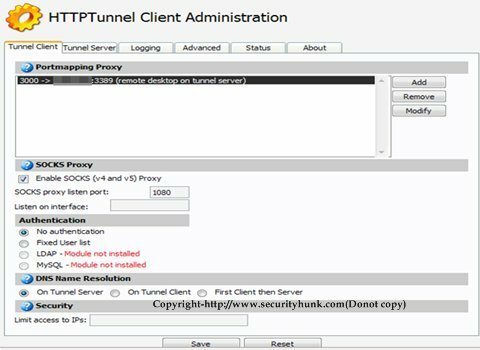 Here I have used the soft named HttpTunnel for tunneling with both server and client.Download and install it. Now click on the client and server part of it and you can use port mapping or socks5 for connecting throught the client. Here I have used Rediff bol as a restricted application and socks5 for connecting.As you set the settings click on "Test" to see if it could connect ot the server,if it is successful then proceed as shown below. Http tunnel in the network can be still detected by analysing the data and packets in the network.On more thing is that http connections last for less interval of time but since in http tunnel with tcp protocol bundled in side it may last for extended period of time so it may create a suspicion in the mind of the network admininstrator.